It was the day after my wedding when I hopped on a plane bound for sunshine, white sandy beaches, and clear turquoise water. I had visited Jamaica when I was younger and always dreamed of going back. I couldn’t wait to bring my new husband to this beautiful island in the middle of the Caribbean. We took the redeye from Phoenix to Montego Bay. After landing at the airport, and still running off adrenaline from yesterday’s big events, I was ready to start exploring! 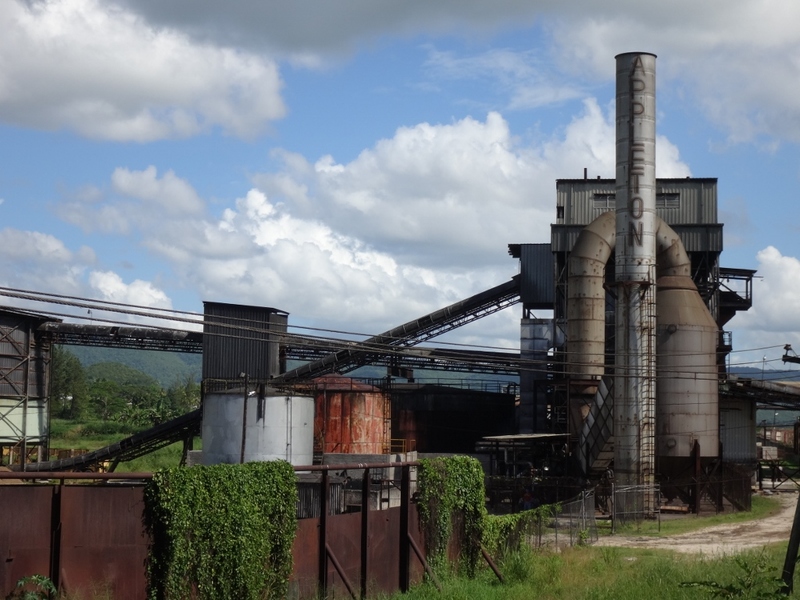 But first, we needed to make the 2 hour journey down a windy, bumpy road (which felt more like a roller coaster ride then a drive down the highway) to Negril on the West End of the island. 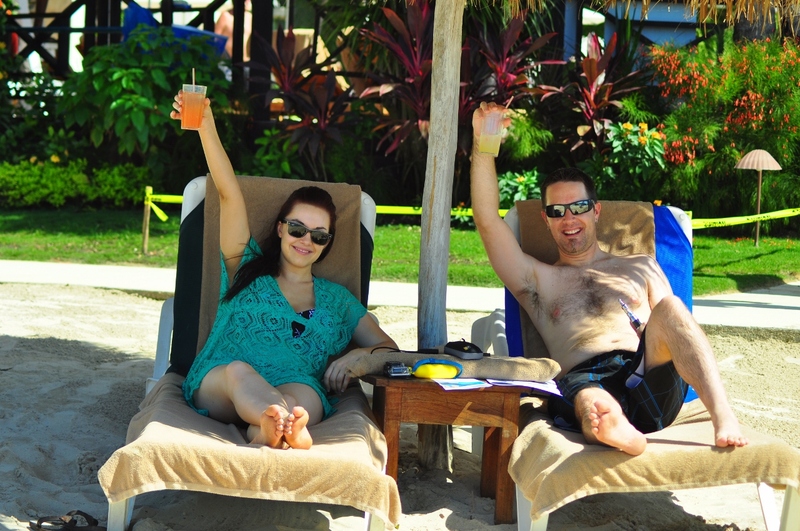 We booked 6 nights at the incredible Sandals Negril on the 7 mile beach. There are quite a few Sandal’s resorts located in Jamaica. 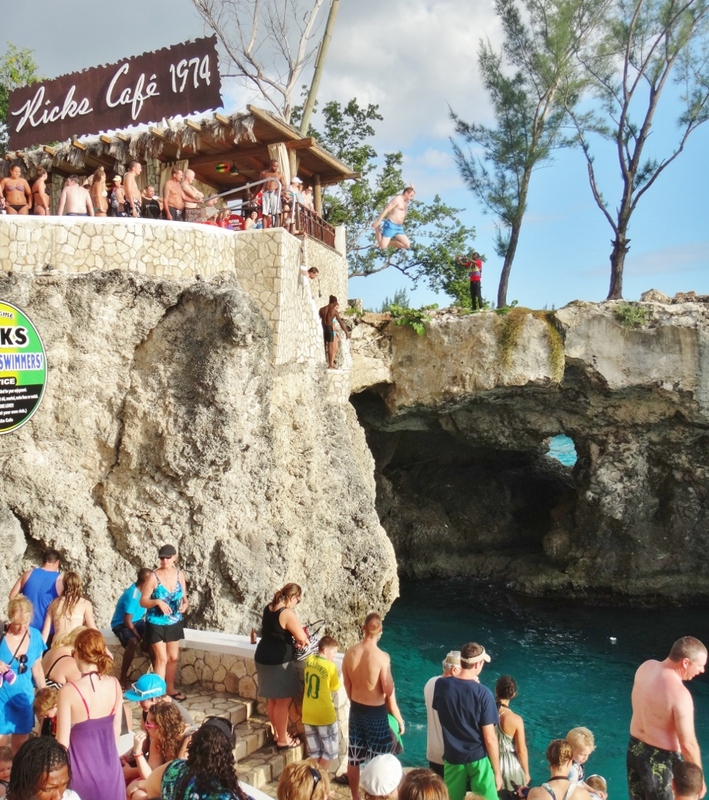 We picked Negril for its proximity to many adventurous activities, laid back vibe, and smaller, intimate property size. After our 50 mile joy ride from Montego Bay, we arrived at the resort and were greeted with cool wet hand towels and a refreshing Pina Colada decorated with a little blue umbrella. If that wasn’t enough of a greeting, we were informed that our room was under renovation and received a free upgrade to the 2-story honeymoon suite! We quickly took our keys and hurried off into the direction of our room, excited to see the upgrade. Opening the door to the honeymoon suite, we found a beautiful Caribbean themed living room and dining room area with a bottle a champagne on ice in the middle of the room, along with chocolate covered strawberries and a fruit/cheese/cracker plate. We walked up a spiral staircase leading to the loft that was furnished with a large king sized bed and a stunning view of the ocean. 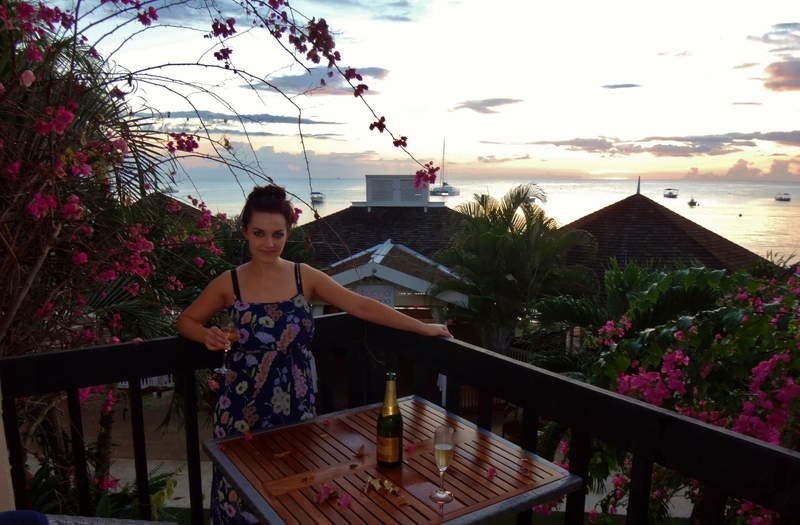 We grabbed the champagne and headed out to our balcony where the sun was setting over the ocean. Within the next few minutes we heard a knock at the door. It was our butler for the week – yes, a butler! Apparently our upgraded room category came all-inclusive with a very friendly butler who handed us a cell phone to keep during our stay. We were told to give him a call whenever we needed anything – drinks, food, reservations, anything! Before leaving, he asked if we would like him to unpack our luggage. This caught us off guard; we weren’t used to this kind of service. We kindly thanked him – we could handle the unpacking ourselves. We grabbed dinner at the Sandal’s Bayside Buffet where we enjoyed a great show of traditional Jamaican dance while we ate. After sleeping in, we started the day off with some world famous Jamaican Blue Mountain coffee before heading to a much need couple’s massage at he Red Lane Spa. I don’t know about you, but airports always seem to wear me out. A relaxing massage was just what I needed. We spent the rest of the afternoon on the beach and stumbled across Sandal’s Bella Napoli Pizzeria in the center of the resort. Each pizza was handcrafted and made to order – chose from a list of specialty pies or create your own by picking from an assortment of toppings. 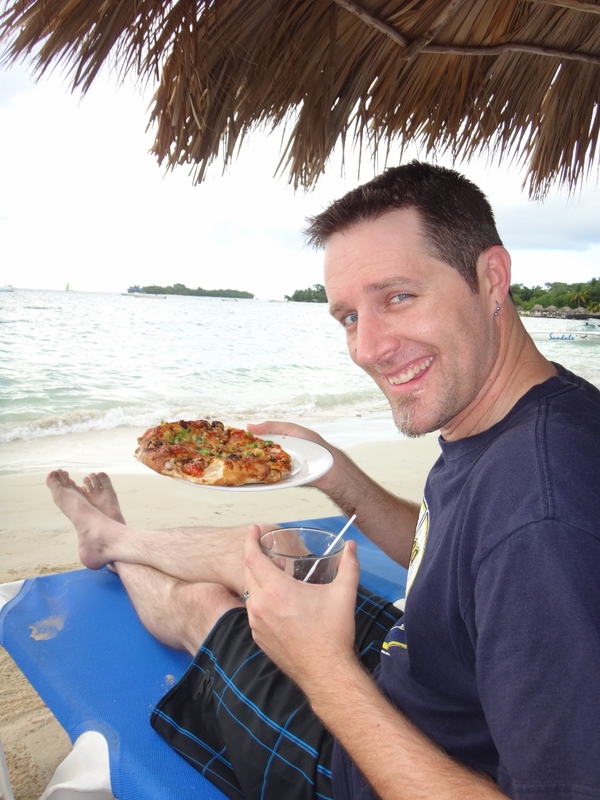 I really enjoyed the Jamaican jerk chicken pizza and the shrimp gorgonzola. After my first bite, I could tell this would be a place we frequented more than once during our stay! A few hours before sunset we made our way down to the beach where we were supposed to meet for a sunset catamaran cruise. We booked the excursion through the Sandal’s website, along with about 50 other couples. 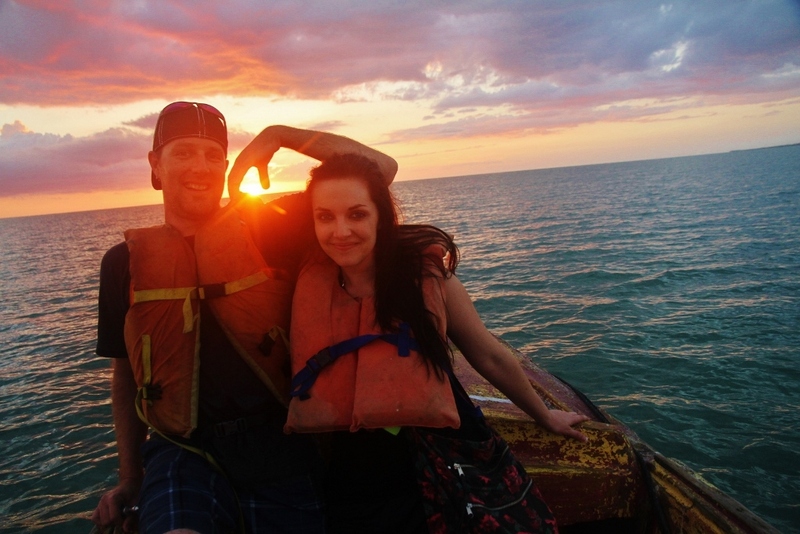 We could tell this wasn’t going to be the relaxing sunset boat ride we thought it would be. 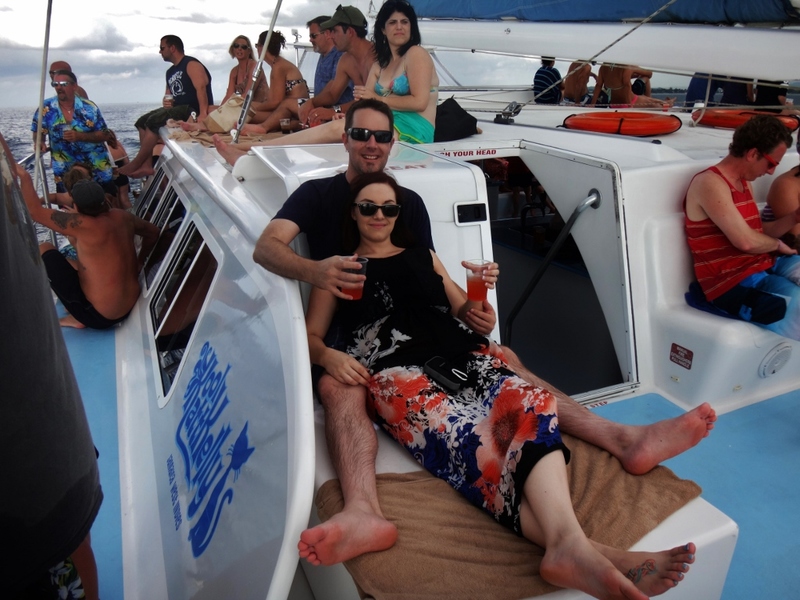 Instead it turned into a giant party boat “booze cruise.” No worries – we were ready to have some fun! We boarded the catamaran and it was a scramble to find a good seat. We ended up near the front of the boat and found what looked to be a pretty comfy spot so we grabbed some rum punch settled in. It took about an hour or so before we arrived at Rick’s Cafe. The catamaran anchored about 30 yards offshore, so we jumped in the water and made a swim for it. We spent some time watching the cliff jumpers and souvenir shopping before heading back to the boat. After one more stop at Margaritaville, the sun finally started to set as we made the journey back to Sandals. 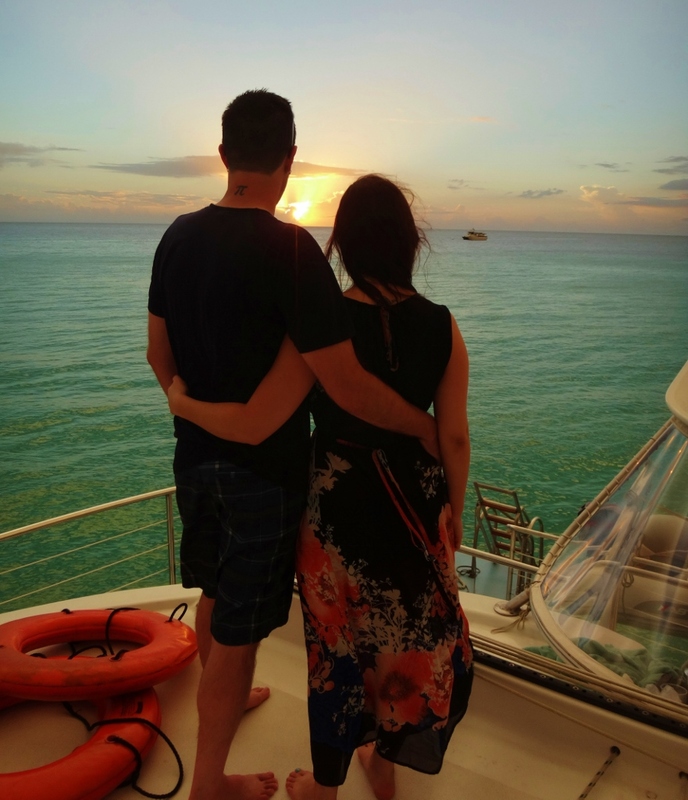 TRAVEL REVIEW: Sandal’s Catamaran Cruise Must do! A few months before our trip I contacted Angie, owner of Juju Tours. 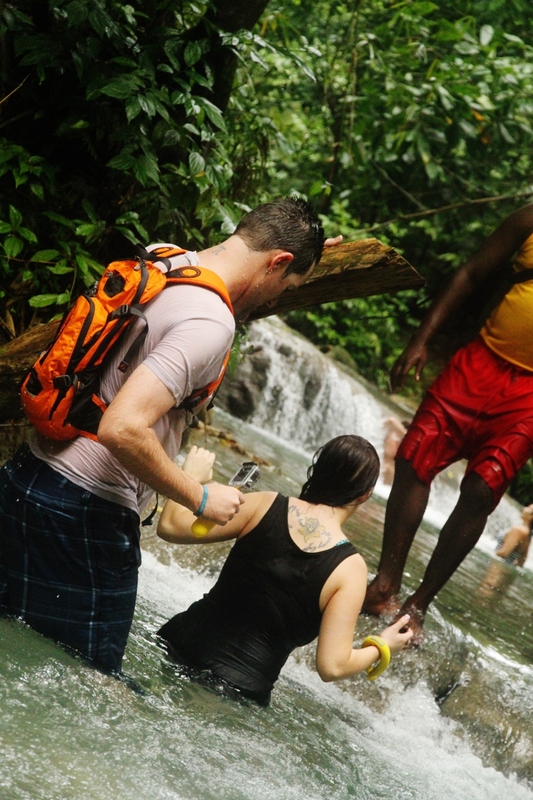 I found Angie on TripAdivsor, where Juju Tours was ranked in the top 3 of all tour companies in Jamaica and had 100% 5-star reviews. I thought it was too good to be true. I emailed Angie and got a response right away; she helped me plan two perfect full days of private activities around the island. Our first of the two days included a Mayfield Falls River Walk and a trip to the Blue Hole Mineral Spring. Angie and her assistant, Rowan, picked us up at our resort at the agreed upon time. Angie popped opened the back door of her van, reached into an ice chest and handed us each a Red Stripe. From that point on, we knew we had a great day ahead of us. We all jumped in the van and headed out towards Mayfield Falls. During the van ride we got to know each other; we learned that Angie was a New York native who moved to Jamaica to live the island life and start her own tour business. Rowan was a local Jamaican who was just starting his career in professional photography. Lucky for us, he had his camera in hand and took hundreds of photos throughout the day (he even hand delivered a CD full of images to us at our hotel the very next afternoon!). 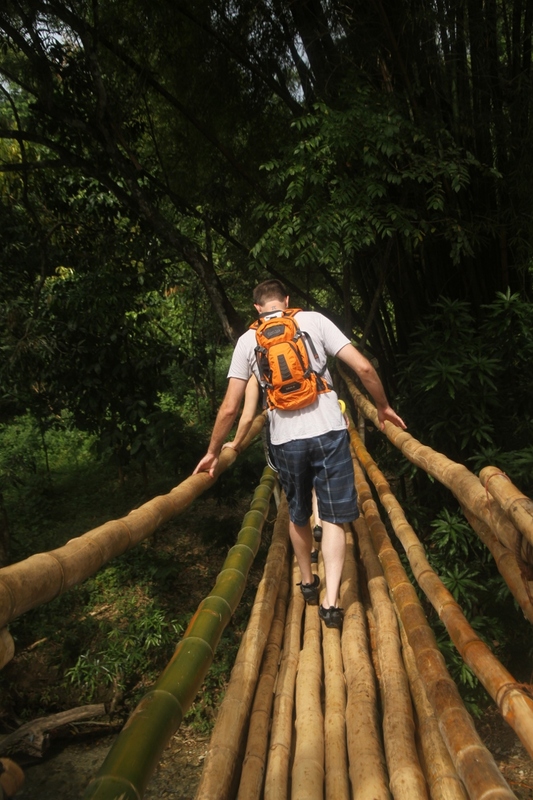 TRAVEL REVIEW: Juju Tours Trip Highlight! 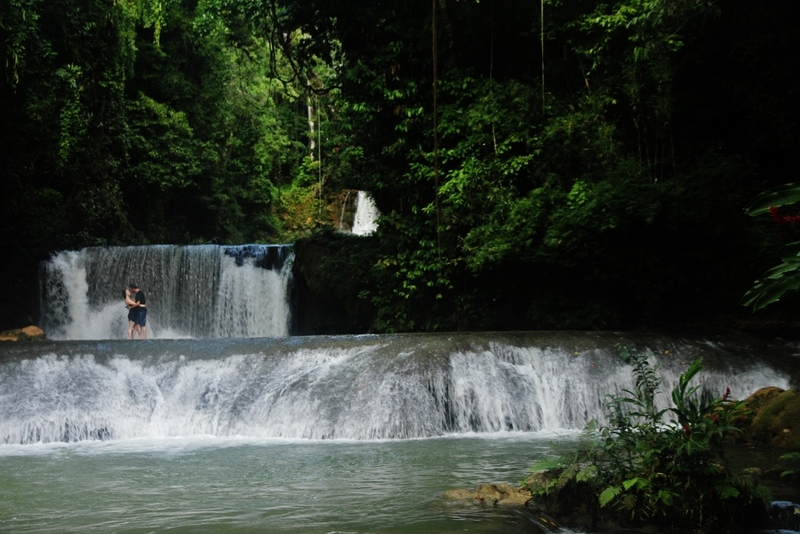 Mayfield Falls is a lesser known destination and many large tour companies don’t offer it as an excursion, making it an ideal place to avoid tourist crowds. We arrived at Mayfield Falls and descended down the bank towards the river. 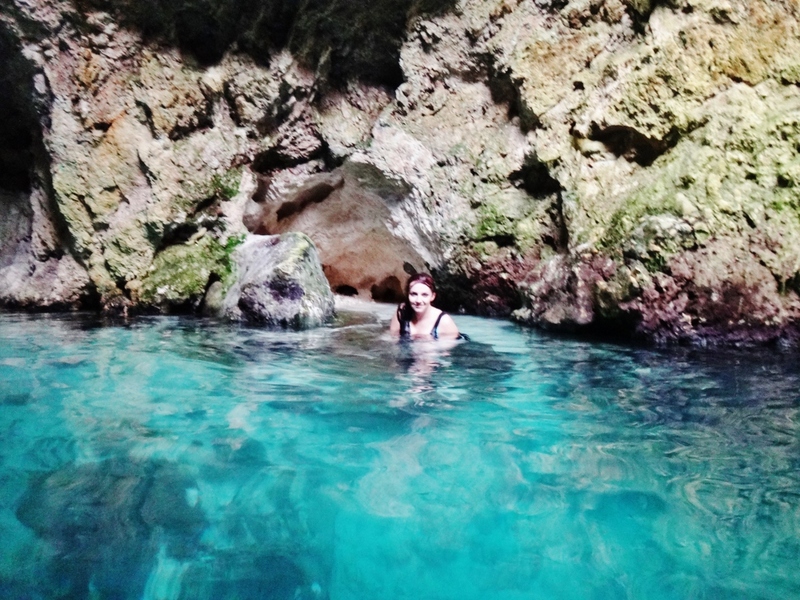 Our guides took us through an incredible 2 hour walk through the refreshing turquoise river where we trekked through the water, dove through underwater caves, swam behind waterfalls, scrubbed our skin in natural mineral mud, and learned about the local environment. 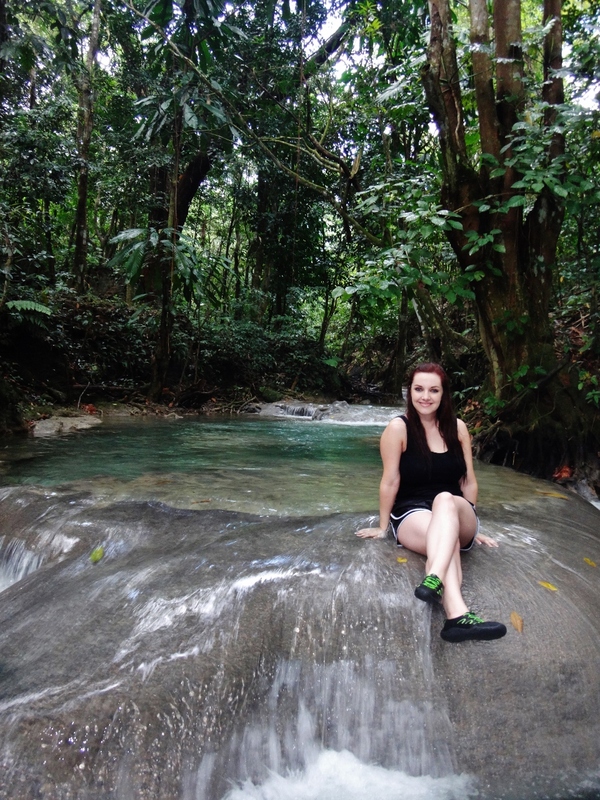 TRAVEL REVIEW: Mayfield Falls River Walk Trip Highlight! After the long river walk, we made our way back to the van. Angie handed us two cups filled with rum punch that she had stored in the ice chest. 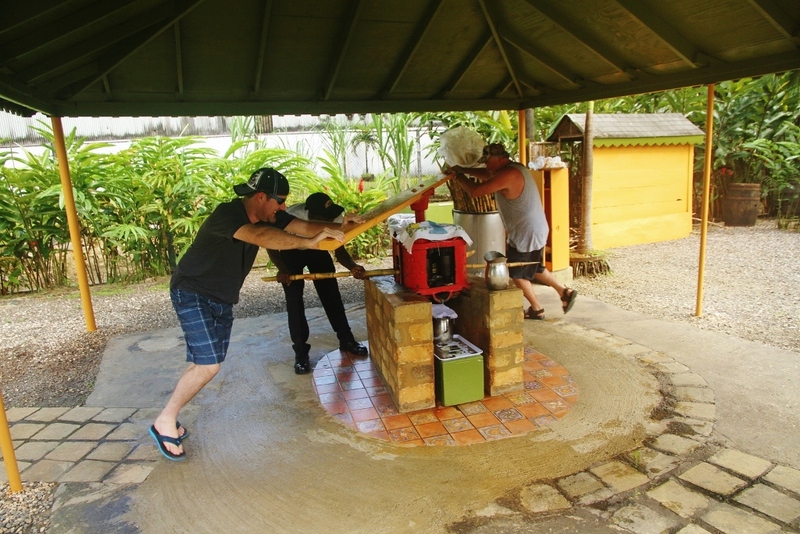 Before arriving at our next destination we stopped at a local restaurant for lunch. We pulled up to what looked like an abandoned shopping center and made our way down a poorly lit hallway. We weren’t sure if it was a restaurant we were headed to, but before we knew it, we arrived at a small grill with a couple of menu options written on a poster board. We opted for the catch of the day which was a Red Snapper served whole with a side of seasoned rice. 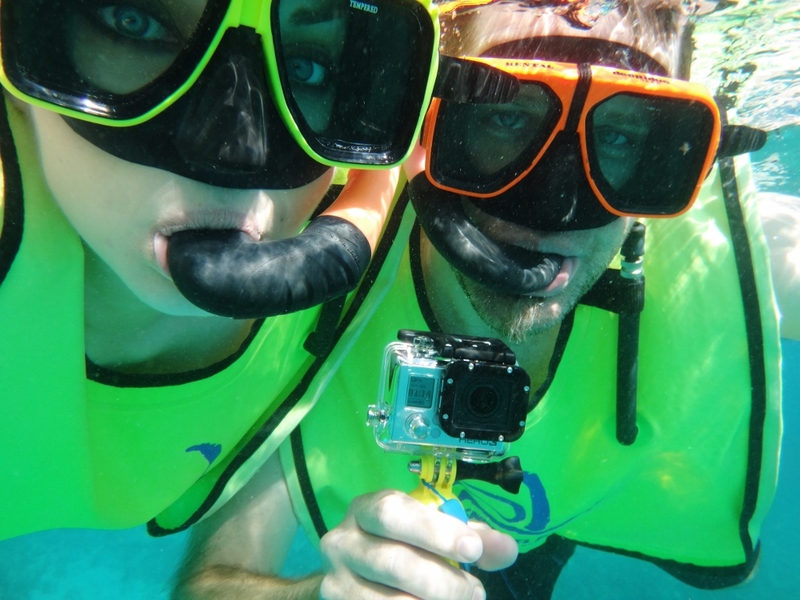 Apparently fish eyes are a delicacy but we weren’t feeling courageous enough, so we gave them to our guides who gladly accepted. Tucked away in the Jamaican country-side, the Blue Hole Mineral Spring is a little off the beaten path. 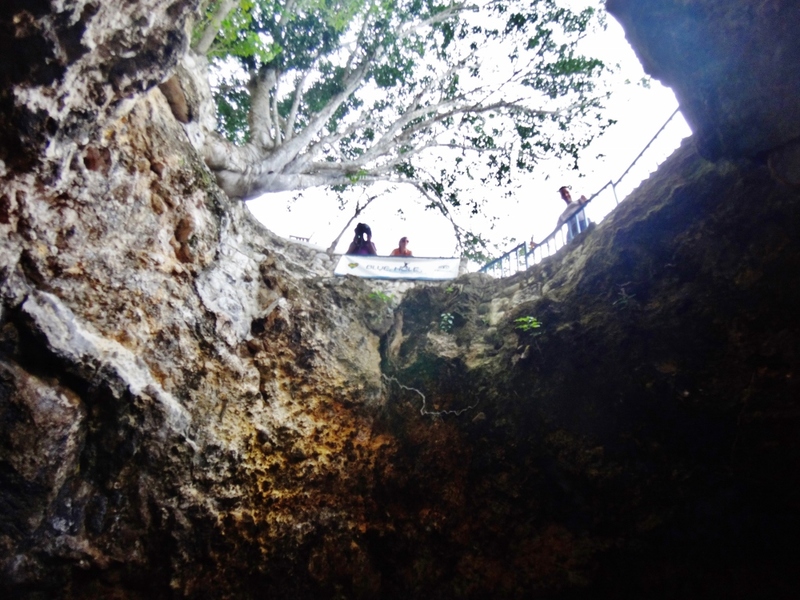 The cave-like opening in the ground stretches 25 feet down to the turquoise mineral water. 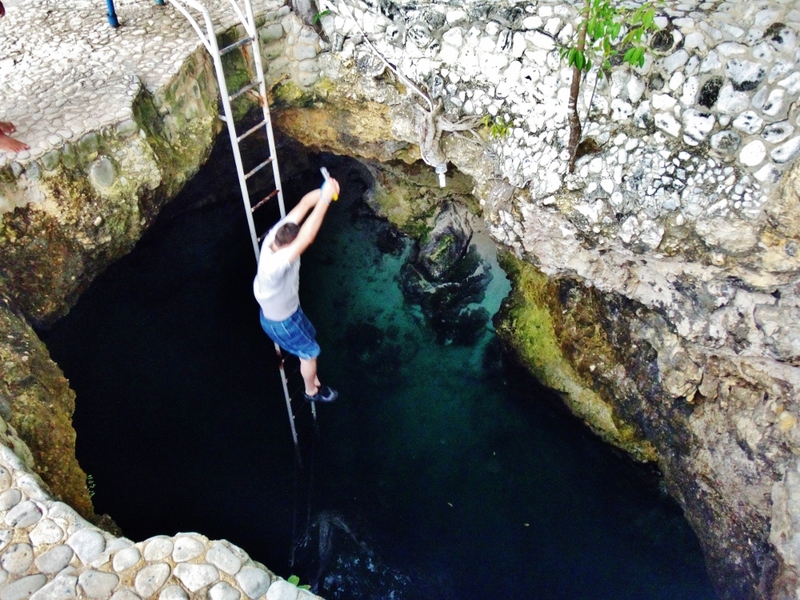 The hole is completely encased in limestone, a naturally occurring mineral that filters the water, leaving behind a clear, clean, natural pool. We were invited to cliff jump into the deep mineral water below. The Blue Hole water was colder than we anticipated, so we didn’t stay for long. But the water was some of the bluest and clearest that we had seen. We arrived back at Sandal’s Negril in time for a quick nap before dinner. 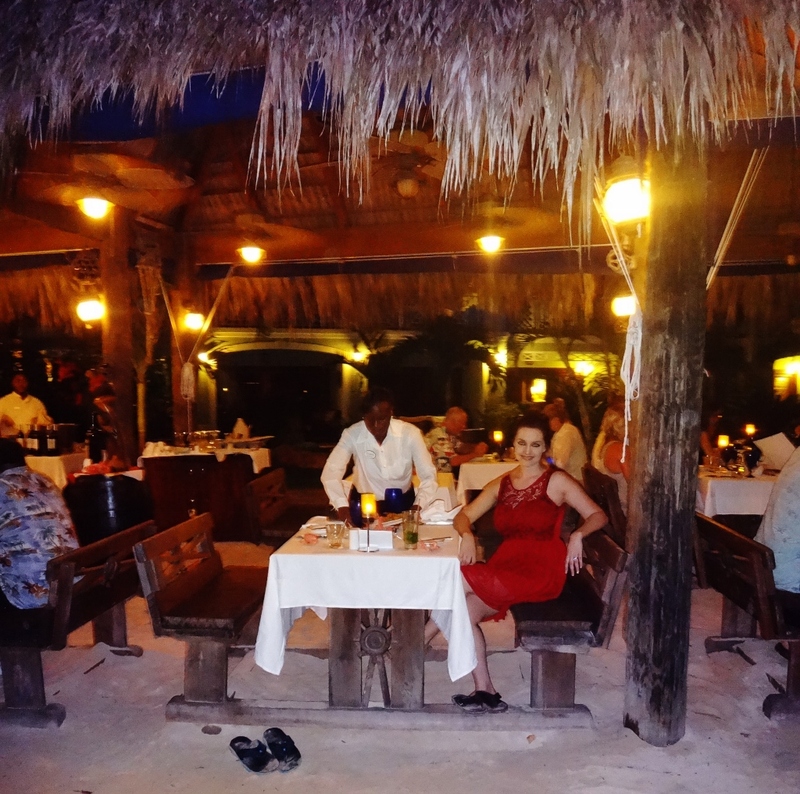 We dined sans-shoes at Barefoot by the Sea, a “shoes optional” Sandal’s restaurant that serves fresh seafood while you sit ocean front. We had fun digging our toes into the beach sand while we ate. We decided to spend the day relaxing on the beach at our resort. 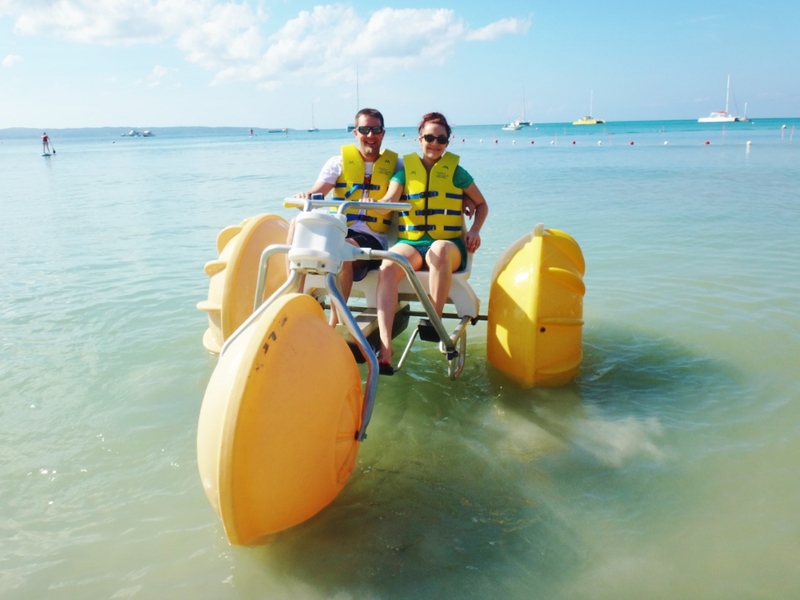 Sandal’s offers all-inclusive water activities and use of water toys. We went out on a Sandal’s snorkeling trip, took out some kayaks, paddle boards, and a hydro-bike. 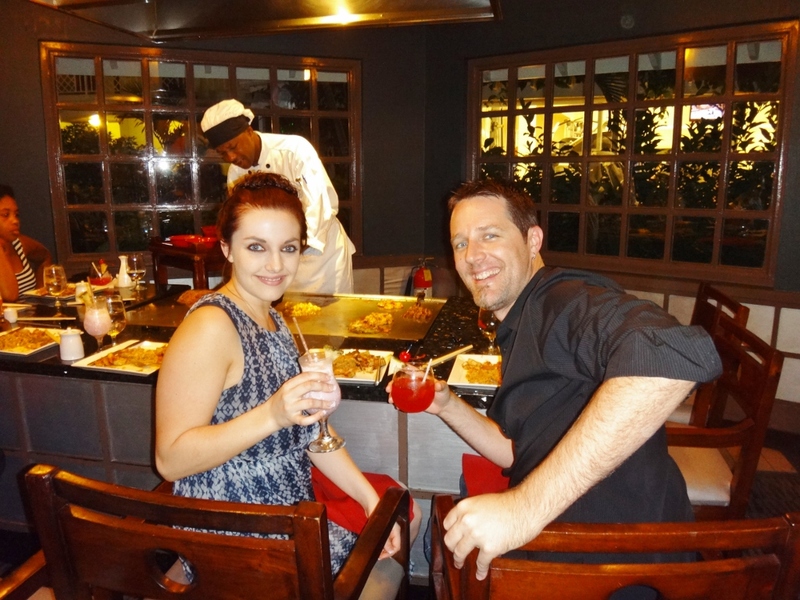 In the evening, we went to Sandal’s Kimono Tepanyaki restaurant which served Asian food with a Jamaican flare. The food, service and atmosphere was lively. We woke up early to meet our Juju Tour guides in our hotel lobby at 8am. 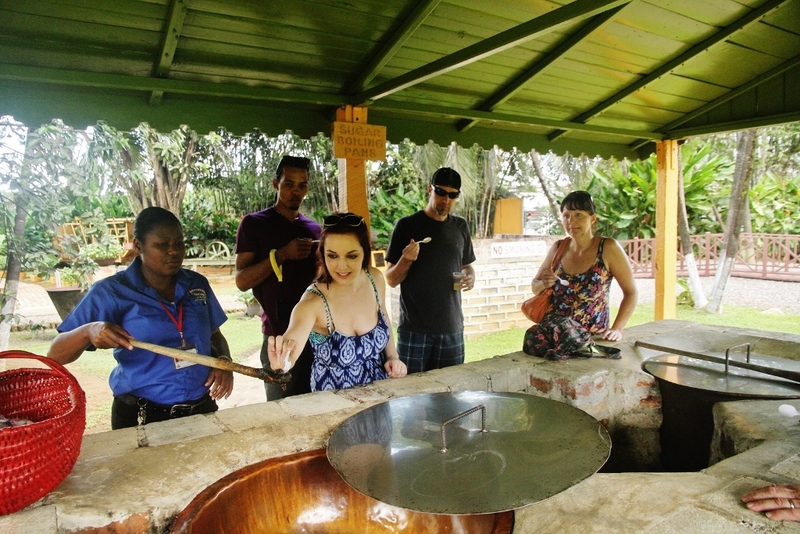 Starting the morning off at the Appleton Rum Estate may or may not have been the best idea, but we were looking forward to getting a behind scenes view of the production of Jamaica’s finest rum. 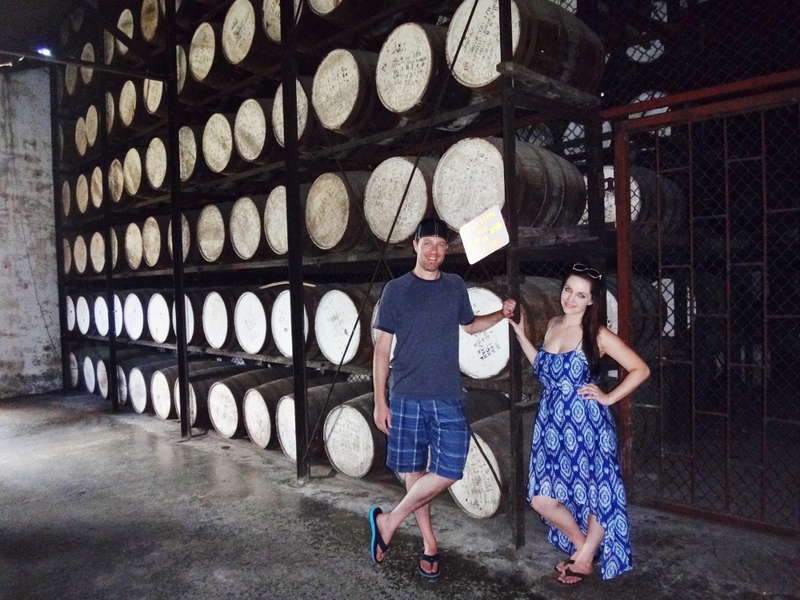 We had a two hour tour of the estate including an inside look at the distillery, the aging house, and historic production tools. 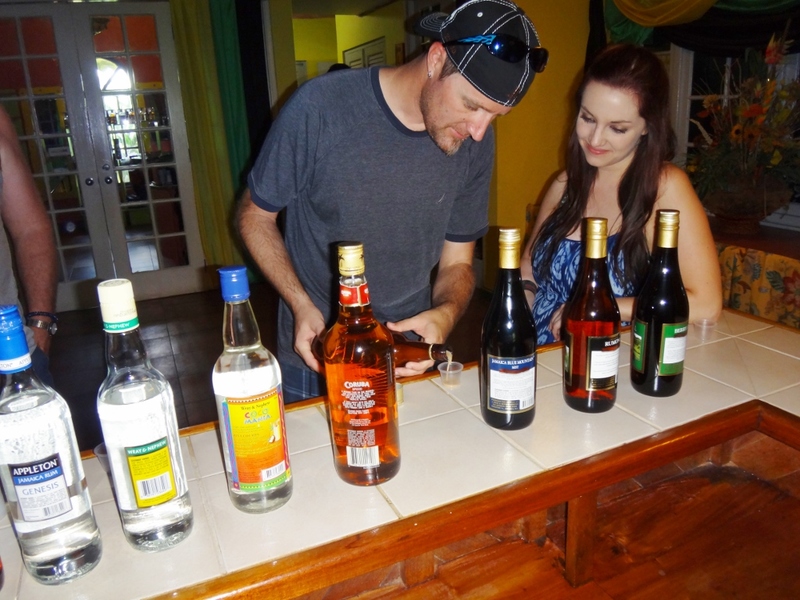 We ended the estate tour with a tasting of Appleton’s 10 varieties of rums. 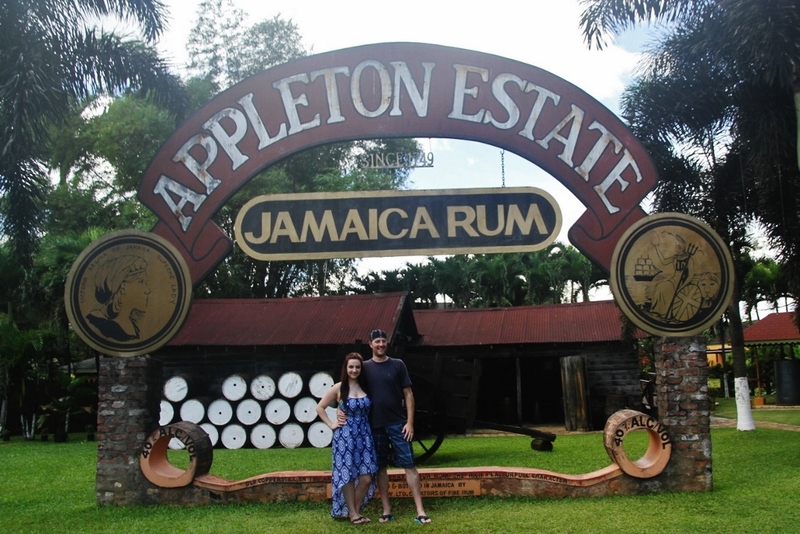 TRAVEL REVIEW: Appleton Rum Estate Must Do! Next, we headed to a series of seven waterfalls, several of which cascade into natural pools. This jaw-dropping destination is known as YS Falls. Just before arriving at the falls, we stopped by a Jamaican patty stand for lunch. A patty is a savory pastry that contains various fillings (traditionally ground beef) and spices – kind of like a hot pocket. YS Falls were spectacular; definitely some of the largest waterfalls that I’ve swam in. 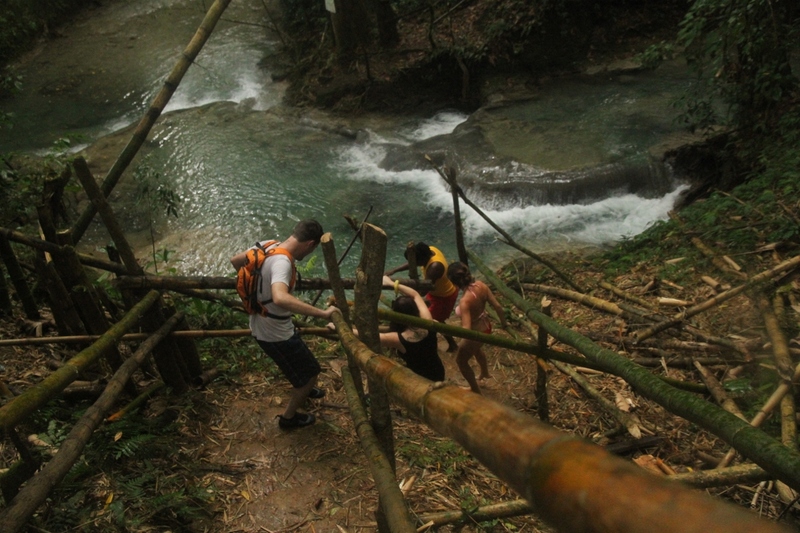 We spent some time exploring the cascading water and even tried out the rope swing. 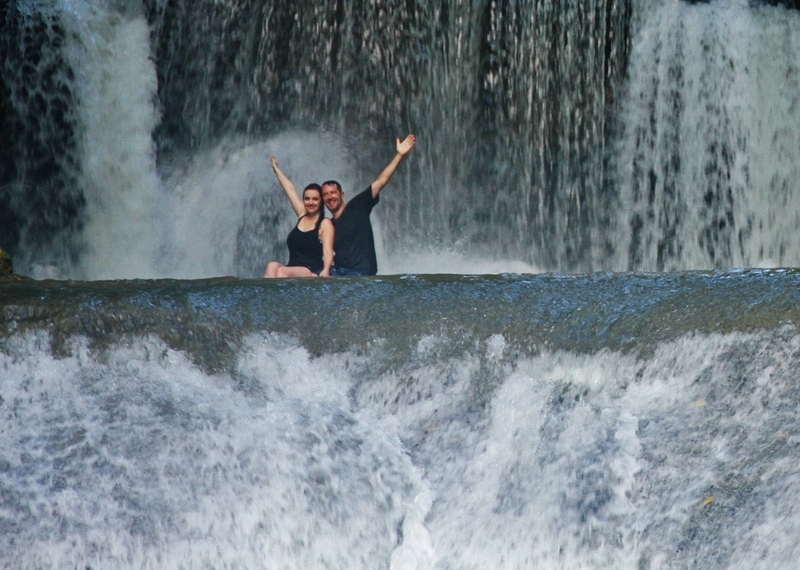 TRAVEL REVIEW: YS Falls Must Do! Our next, and final destination for the day, turned out to be the highlight of our trip. 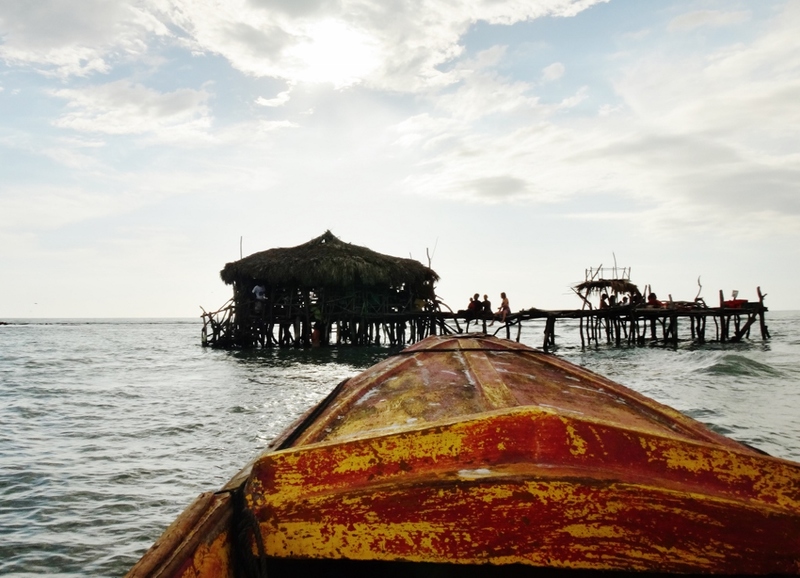 We headed to a small fishing village about an hour away, where our Juju guides hired a local fisherman to take us out to Floyd’s Pelican Bar for dinner. 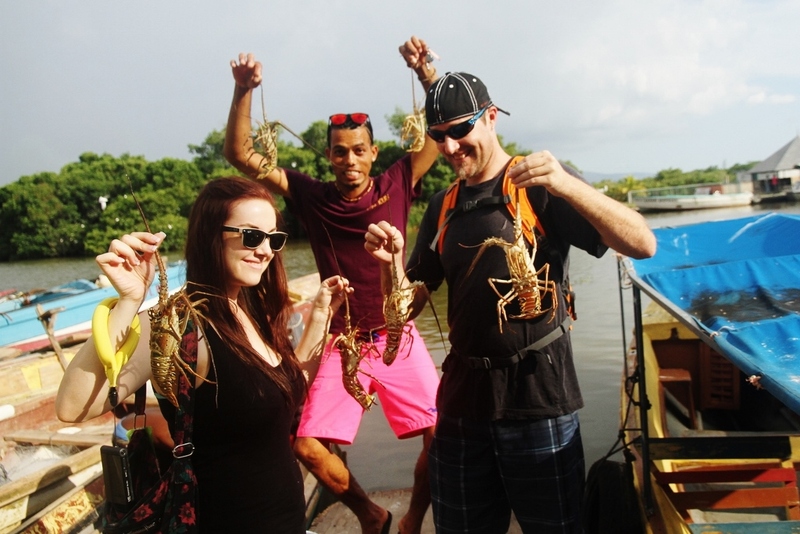 We arrived at the mouth of the Black River and made our way down to the boat dock where a man was unloading a fresh catch of lobsters that he was excited to show us. 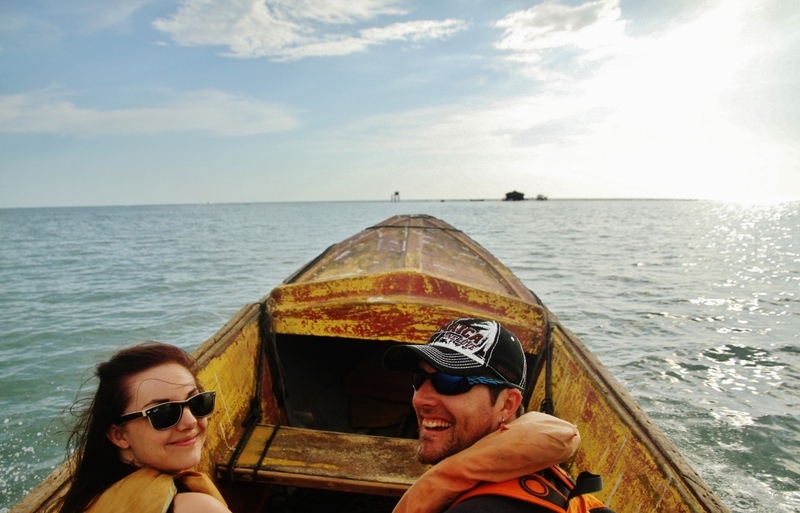 After exchanging hellos, we boarded his small boat and made our way out of the Black River into the open ocean. 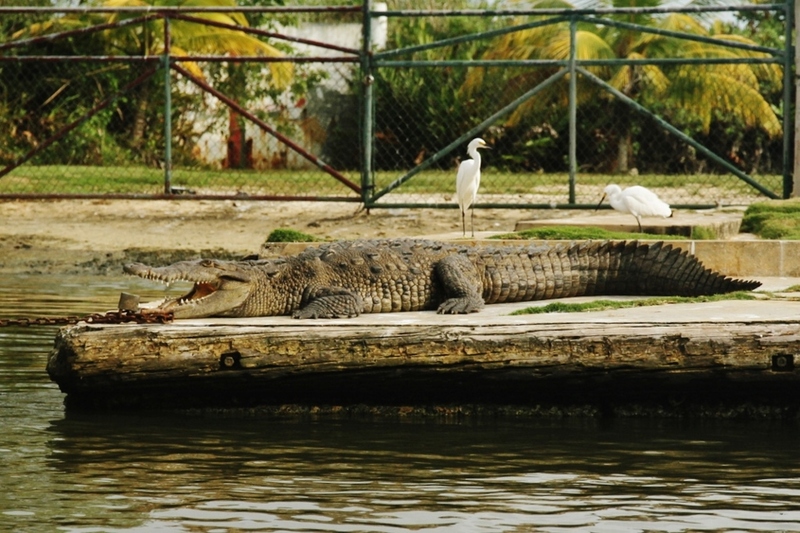 But before we reached the sea, we spotted some very large and unfriendly looking alligators along the shore. This wouldn’t have been too frightening, but at that very moment, the fisherman began shoveling water out from our boat with half of a 1 gallon milk carton. This wasn’t the place that I wanted to have a sinking ship! 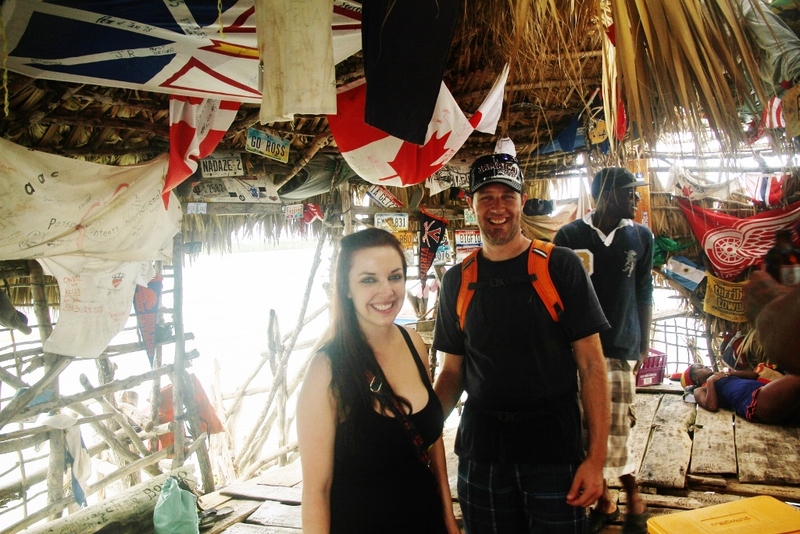 We made it out of the Black River intact and anxiously awaited our arrival at the Pelican Bar. 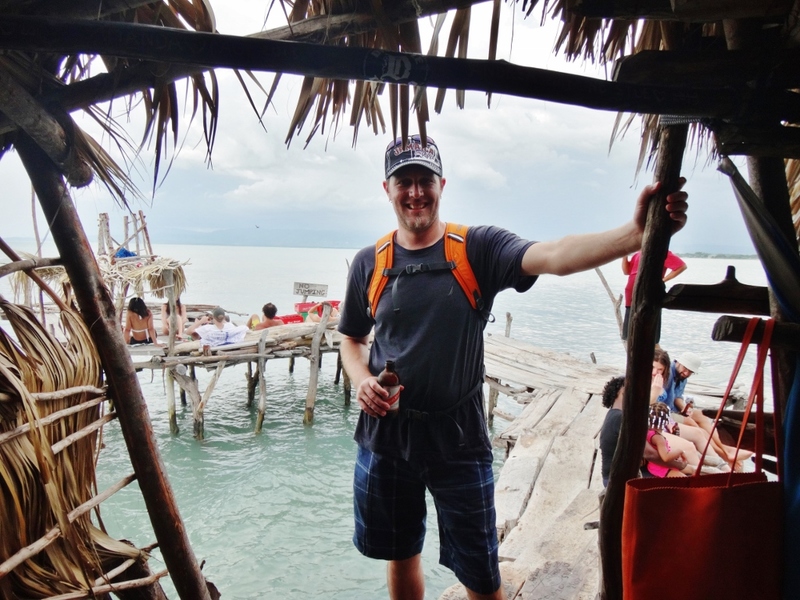 After a 30 minute boat ride we could see Floyd’s Pelican Bar off in the distance. The atmosphere was definitely a local one. There were about 10-15 people hanging out, drinking beer, and playing Dominos. We headed to what looked like the ordering window and were given a choice between Red Snapper and lobster. They serve only the catch of the day, cooked on a wood fire grill (it is my understanding that you should call ahead to order food, which our guides did for us). We ordered the lobster, of course. We grabbed a drink and took a seat. Within a few minutes we had a plate of steaming hot lobster cooked in a spiced sauce with a side of seasoned rice. This was one of, if not THE BEST meal I’ve had. The lobster melted in my mouth with flavors that were out of this world. I hope I get the chance to go back one day soon for another amazing meal! We spent the next couple of hours outside on the deck soaking in the sun. 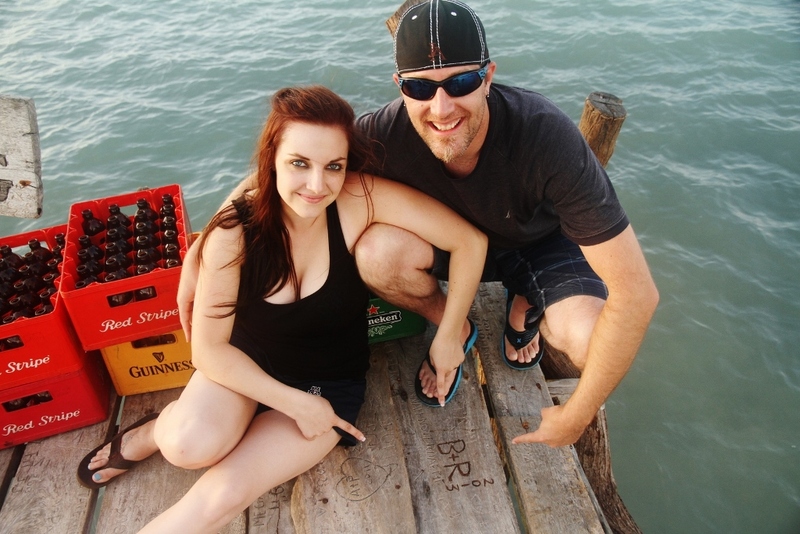 One of the locals encouraged us to carve our initials into the wood, and handed us some carving tools. We found a good spot and left our mark. 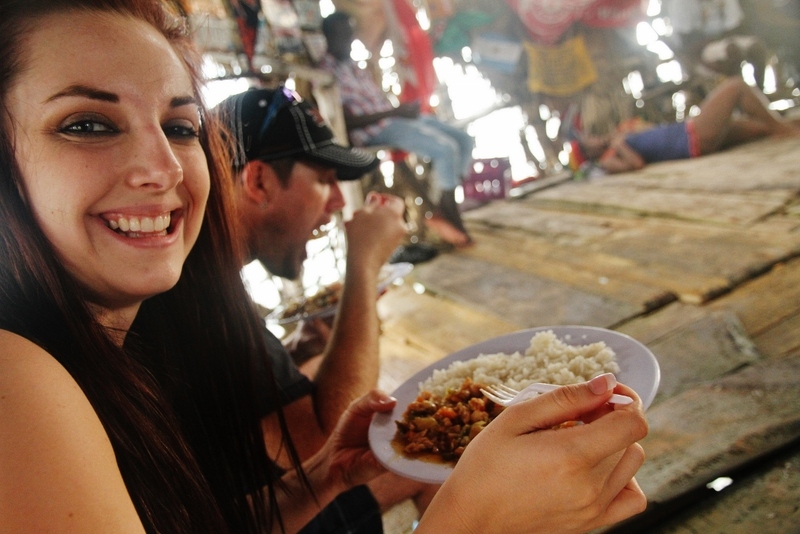 TRAVEL REVIEW: Floyd’s Pelican Bar Trip Highlight! The sun started to set and the fisherman who we had hired to take us to Floyd’s came back to pick us up and take us back to the dock. The ride back was peaceful and calming as we watched the sky light up with beautiful colors. It was nice to spend a full day unwinding at the beach after a full day of adventures the day before. We found a spot under a palm covered cabana, ordered some Pina Coladas, and spent some time leisurely kayaking the coast. 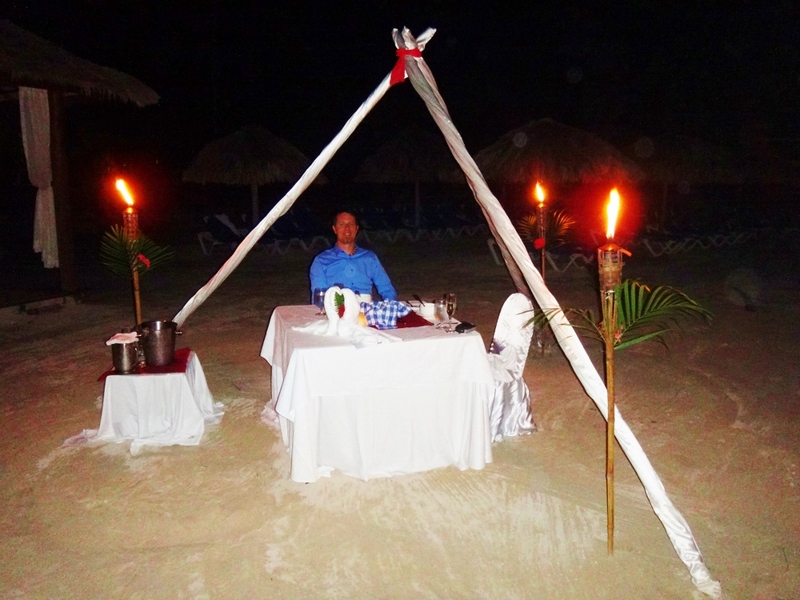 Our last night in Jamaica was spent at a candlelight dinner on the beach. Sandal’s offers private dinners under the stars, served by waiters in white gloves on a table specially decorated with tropical floral arrangements and candle lights. The dinner courses are pre-selected by you the day before and the menus are printed specially for your private dinner. This was the perfect end to a wonderful trip and was one of the most romantic settings we could have dreamed of. TRAVEL REVIEW: Candelight Dinner for Two Trip Highlight! DAY 7: Goodbye Jamaica, Until Next Time! The week had come to an end and we enjoyed one more breakfast on the outdoor patio of the Bayside Buffet. 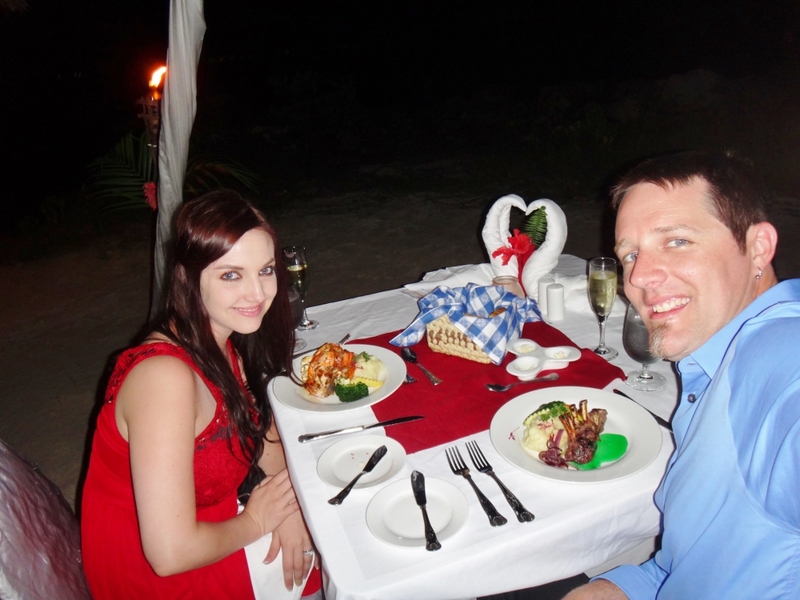 Our stay at Sandal’s was wonderful and we really enjoyed the all inclusive resort style. It was sad to say goodbye to this welcoming island, but we will be back again someday! 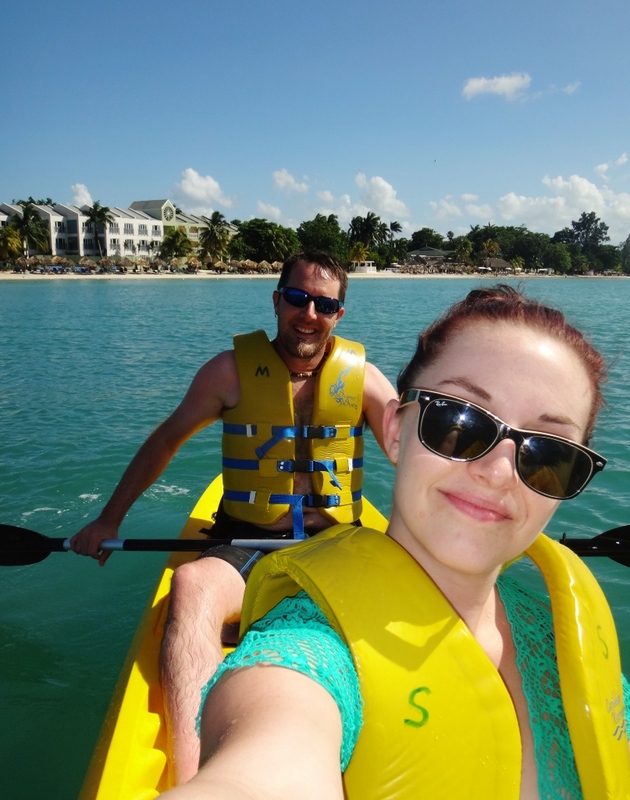 TRAVEL REVIEW: Sandal’s Negril Resort Must do! 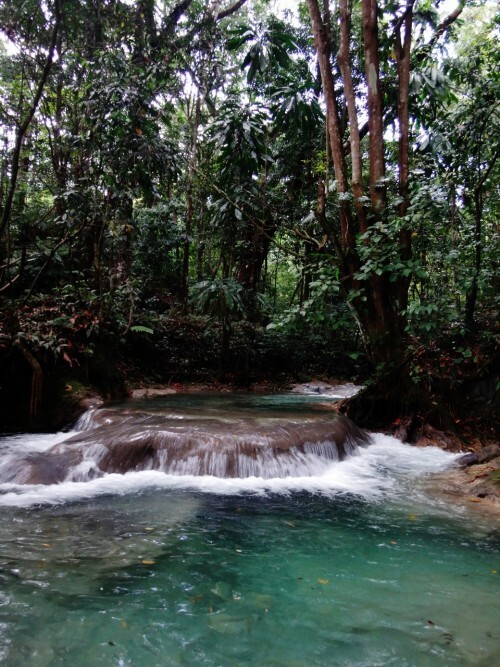 Looks like an amazing time in Jamaica…makes me want to take a trip down there…like right now! Thanks for linking up with Travel Tales!